I’ve not written or posted an original work in quite some time, but a question I found on Quora (footnoted) this morning, triggered me to complete something I’d started 10 months ago, so here it is.
. What comes to mind? I had to look the former one up, because I really had nothing on him, other than a quote. It was the latter, however that I drew my inspiration from. Rev. John Walker, on the other hand could be a person of interest for our modern times. The other day, I was perusing Facebook and came across a comment made by someone I do not know regarding a link from a person I do know that had shared from someone else he knows. You know how those things go. It’s social media. All in all it resulted in a chain of connections that took me to comments for the “shared” item. One comment in particular caught my eye because it was negative about a positive post. Curious, I clicked on that person’s name thinking there might be something there to clue me as to why this person was so defensive. As I scroll down his page, I didn’t have far to go before I realize this person lives on the dark side of the moon. How sad I thought. Mostly I saw pictures that depict one injustice after another and really that’s all there was. There was the cheering for someone who pulls out a gun and shoots a purse snatcher, I guess that could be good if not a bit excessive? Another for some presumed injustice that did not appear to be anything more that a person being pushed around as they maneuvered through a crowd, which could happen to anyone. The picture that really caught my eye though, was an old one of two people hung. A mother and son to be exact. Below the picture there was the caption explaining why they were hung, which was totally unjust. The two people were black and it appeared that that was essentially their only crime. It was 1911. It was horrible and sad. Yes, those things happened. I hate them too. These injustices happened to blacks, but it happened to whites as well. Unfortunately, blacks were more frequently targeted and today more focused on. This world is not fair by any stretch of the imagination. They happened and it was abhorrent. My father would often defend his use of certain words that were common in his day. It was there nature of speech, but not necessarily their opinion. My father and his father of the 1800’s spoke that way. I know from what my father says, “your grandfather employed blacks and treated them decently”. But what was decent in those days? It is history but it is not nor does it have to be your history. I had a hard time communicating that to blacks I worked with. They have a difficult time letting go of the past and any overtures of kindness are met with disdain or as being condescending. We need to learn to accept that’s how it was. Somewhere along the way all of us must recognize the past as past and the past cannot be changed. We can’t “fix” that, there are no do overs of he past except in Hollywood. We can only change what’s ahead of us and how we think and behave is the only thing we have any control of. This poor soul’s whole FB page was dedicated to focusing on wrongs committed by whites and yes, he is black. This tidbit was not shared for its historical value so much as a reminder to hate. To not forget. Why else dwell on it? It broke my heart to say the least. It’s no wonder progress toward equality stagnates. I thought of the big hoopla that was made last year about “OscarsSoWhite” **and how of late we see things going backward rather than forward. Why is that? I know many wonderful blacks who I consider friends, but I’ve also met some very racist blacks who blame everyone but themselves for why there is racism. Could Hollywood be part of the problem? Hollywood creates stereotypes and I think sometimes our impressions of certain races is based on these. When I lived in the south my perception of blacks, whites or Hispanics was different than it is in California. In California, Hispanics actually speak English and blacks are pleasant and friendly, whites are superficial and everyone’s a health nut. In Alabama, Hispanics don’t speak English, blacks are angry and antagonistic, whites are generally working hard to change their public persona. Both states have lots of homeless. I had a white friend terrified to open her mouth in California for fear her accent would cause people to be ugly to her assuming that if she was from the south then she must be one of those bigots, which is the farthest thing from the truth. Fortunately, no one did this. If racism is to be overcome, the barriers need to fall on both sides. It isn’t something only whites are responsible for accomplishing. This mentality does not only plague blacks, it plagues everyone. It plagues the poor, the rich, the sick, the Hispanic, the Asian, the gay or any other group out there that can be slighted. It seems that the more politically correct we try to become the more cause there is to be offended. There will always be slights. It’s a given because of our humanness. Have I experienced racism? Sure. Ironically, it was when I lived in California not Alabama that prejudice smacked me in the face. When I was 20, I dated this young man from a upper class family in La Jolla. He took me to his home to meet his parents, thinking nothing of it. They were cordial, but later he would break up with me because his parents didn’t want him marrying or dating an Hispanic. I guess it was like him mixing with the help. Was I hurt? I was chagrined, yes. Angry to tell the truth, at him for not having balls enough to stick up for himself or me. I guess you have to care to do that. Was it permanent? NO! I got over it. Did it ruin the rest of life? Hell no! Did I look for slights everywhere I went? NO! Why should I? As anyone who’s been following my blog knows, I’m originally from Alabama, but I really didn’t grow up there or live there for long and what memories I have are positive. There were no racial events to tar my memory, other than being called a “yankee” because of my accent. In fact, the kids I went to school with loved me. I was a novelty. My “white” cousins were proud to say they were related. My mother however, was not fond of it and very aware of her swarthy complexion, but that was her. I never noticed anyone singling her or me out. She was more self conscious of them being white than they were of her being Hispanic. At 60, I moved “back home” and I will admit, I was self conscious at first, but I needn’t have been because I was received well. Blacks in general would however focus on my ethnicity more than whites did as if it was supposed to cause me problems, but it never did. Sadly, I noticed how so many of them kept bringing up the past and were unwilling to let it go or forgive and in so doing found an affront everywhere in anything anyone said. Some admitted this was a problem. My dad used to say “if you believe you’re different, you’ll be treated accordingly”. It was the best advice he ever gave me. In my many years of living, I’ve gotten along in life not holding onto the race card, not wanting to call attention to my difference and treating others the same. We can’t help what previous generations did, but we can help what this one does. How do we change conditioning and antagonism? Globally, it seems overwhelming and I don’t really have a good answer. What I do know is, feeding on bitterness and hate gets us nowhere. I wanted to say something positive to that young man who thought so negatively, but I didn’t know what I could say that would not be construed as a racist attack, so I left it alone and blogged instead. Will he see this? Probably not. I can only recommend myself and offer suggestions. So, if we want change, change what is in your power to change. YOU. Change yourself and you will change the world one person at a time. I like the term, “Pay it Forward”, what you give out comes back. Martin Luther King was in the process of changing black in America. Because he was a Christian and a Baptist minister, he is best known for using nonviolent civil disobedience to achieve civil rights. On October 14, 1964 he became the youngest recipient of the Nobel Peace Prize for his nonviolent methods for combating racial inequality. Later posthumously he was awarded the Presidential Medal of Freedom. Unfortunately Mr. King was assassinated on April 4th in Tennessee. Unfortunately it resulted in a wave of riots. I wonder what Mr. King would have thought about that? Justifiable anger? Absolutely! This was a good, just and fair man. He was making headway on behalf of blacks. There’s been no one like him since. The new Black leaders like , Sharpton and Jackson spew hatred and retaliation, keeping alive the sad past of whites against black. 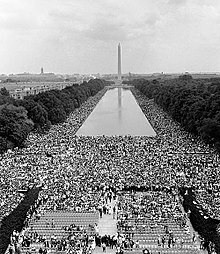 Malcolm X and other more radical black leaders, who were present at the “I Have a Dream” speech and march, condemned the speech along with the rest of the march. Instead they keep stirring the pot, fomenting violence and hate. They do not foster a peaceful resolution. White Supremacists, like Richard Spencer go on to stoke the fire even further as if blacks are the problem. NO, NO, NO!!! Rioting and destruction in black neighborhoods are the new norm and have now become the new mantra and any excuse will trigger it. Blacks don’t even have to be in the right. If anyone of color is killed, accidentally or deliberately, blacks will wreak havoc, sometimes destroying their own neighborhoods and looting their own people. In the presidential citation Mr. King received, there is a statement that I believe can still be true. We all have that dream. We, all of us can make this dream come true. Martin Luther King believed in God and he believed the Bible, which still says it best. Post script: I got this email from my sister just after I posted this, totally unaware of what was transpiring in Florida. I thought it pertinent to my blog. Please pray for the folks in Gainesville. Well, it is another exciting week in Gainesville…remember I told you about that white supremist, Richard Spencer? He tried to come to Gainesville and was denied then when he filed a lawsuit the University had to allow it….but then we had the storms. So, he is now scheduled to speak tomorrow at 2:00 at the Phillips Center. The Phillips Center is within walking distance from me. Since Tuesday there have been swarms of State Troopers along 34th Street. Again, within walking distance from me is a hotel…the parking lot is full of State Trooper vehicles and today on my way home I noticed that cars going into the hotel were being checked. The governor has already declared a State of Emergency for Alachua County. That puts the National Guard on ready so there isn’t time lost in getting them involved if need be. The University has set very strict rules as to what can be carried into the auditorium and one item that is banned is bottled water, but also no bicycles within a designated perimeter around the auditorium. Today when I walked to Winn Dixie there were several helicopters flying circles overhead. So, I guess they are as ready as possible. At work Tuesday, one of the male therapist said he is going to accompany his friend who is a young reporter for the local TV station. His friend is really nervous about this, but also Brad told me that Antifa has been keeping very silent about whether they will attend. Partly because the FBI is monitoring them so they aren’t communicating as much. The interesting thing is that our pastor Sunday said that the pastors in Gainesville have gotten together and asked their parishioners not to attend even if they plan to express disfavor. Pastors very rarely actually tell their parishioners what to do…unless they are in a cult. However, the pastors will be coming together in various locations in town to hold prayer meetings during the guys speech. Today in my women’s Bible study group we also prayed over our city/county for protection, but also that this man’s message is diffused peacefully. The positive thing is that our local news has given our pastor and the local churches more attention than to this man. So, tomorrow at 2:00 eastern please pray for us. I will let you know how the day goes. Next > Accusations Are Flying. This is some truth here. When I say things like that I am accused of being racist and of blaming the accuser. I was even chewed once out by a sociology professor who said that blacks can’t be racist, only members of the dominant (white) group can be racist. I have found in my life and others I know well, the key to overcoming an awful lot of problems is to let go of the past. You’ll never make it to a better future if you chain yourself to the wrongs of yesterday. So true. The key is L-O-V-E and doing so unequivocally. Very hard. Andrew Joyce just shared a story called One Word and it sums it up. Ironically, Jesus gave mankind that one would centuries ago. If we’d only listen.